The fact of the matter is that during my summer break from college at WSU, Stevens Point, Wisconsin, I came up with this great brain storm. I would drive from Wisconsin and drop in and surprise my former East Anchorage Alaska high school girl friend, Susan Estelle Hardin, who was going to school at Vassar. Having worked part of the summer already in and around my WSU campus, I didn’t even think that she might have gone home to see her parents for the summer. Needless to say, I was determined to see her. After driving all day into the western part of the empire state, I spent the night in my 58 Chev and woke early on Wednesday morning the 13th. By mid-morning I came across what appeared to be a line of cars each being checked by a Highway Patrol officer. I asked what was wrong and the officer asked me where I was going. I told him to surprise my girl friend. He obviously didn’t believe me and told me I was another of those hippies going to a music concert. I asked him what concert and he told me I knew and that I can’t go North up that road he motioned to, as it was already blocked with parked cars. So I asked how far to the next town where there was a gas station. He told me to keep going a couple more miles and I would find it. I proceeded on and stopped at the gas station. There I asked the pump jockey where the music concert was and he directed me back to the road I was told not to go up by the officer. So I asked if there was another way and that the road was closed because of the backed up cars. He told me that was the best way to go and his brother already left for the concert that morning so he could get a good spot! He suggested that I leave my car there at the gas station and thumb my way to the concert. I took his suggestion. I had a backpack, tent and a jacket in my trunk so I took those with me and set out on foot. I immediately thumbed a ride back to the closed road. Notice, that I had completely forgot about why I was here in New York in the first place. Quite literally I had gotten side tracked and besides it wasn’t like she was expecting me and gosh, I didn’t even know if she would still be at the school for the summer, right? So there I was, on a Road Trip, but now on a Detour! I walked for what seemed like an eternity, but I wasn’t alone for long. Little did I know at the time, as our destination drew ever closer, the few fellow travelers grew into a throng and then into a mass of humanity all flowing to where our lives would become changed forever as a part of history! At first I really didn’t even know what kind of music concert I was headed for, only in talking with others headed there, did I decide that even though I hadn’t bought a ticket, with as many people who were all going and the groups that I recognized I was told would be there, this had to be great. Within hours of my arrival, I never saw my backpack or tent ever again, much to my chagrin later when the rains came. Never the less, what I experienced over the next week was truly life changing. The sharing, caring, love, peacefulness, euphoria and the genuineness of my fellow mankind was a joy to experience. The very rapture of being moved by the music was exhilarating and painted the colors of the rainbow before my eyes. I most certainly saw or heard most of the acts, some more entrancing than others. While the festival past all too fast, the more somber moments caused me to ache for a dry place to rest and eat real food once again. Munchies are unbearable when there is nothing to eat or savor. Dry clothes would have been nice, but the mud was easily rinsed in the lake and skinny dipping in the warmth of the sun was a luxury. By Monday, most of the crowd had left, yet I didn’t want it to end, so when those of us who were left, were greeted with the Star Spangled Banner, I knew it was time to go back to the world. I was befriended by a farmer on the march back to the highway with a clean shirt and a welcome lunch. I retrieved my 58 Chev right where I parked it 5 days earlier. An experience of a lifetime, that felt like a lifetime of Peace, Music and Joy! 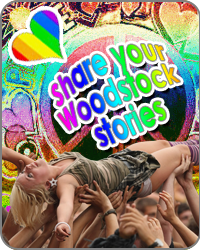 May the memory of WoodStock live on forever! Have a Happy and Peace Out!